For those that are following us on Twitter, you might have seen that Blizzard is quite active over that social media. 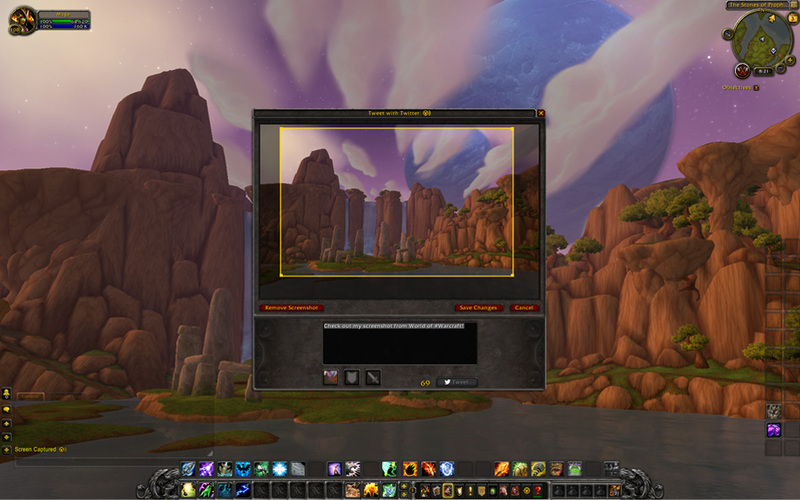 An ingame functionality that would allow Twitter and World of Warcraft to co-exist was only nice to improve that feeling. 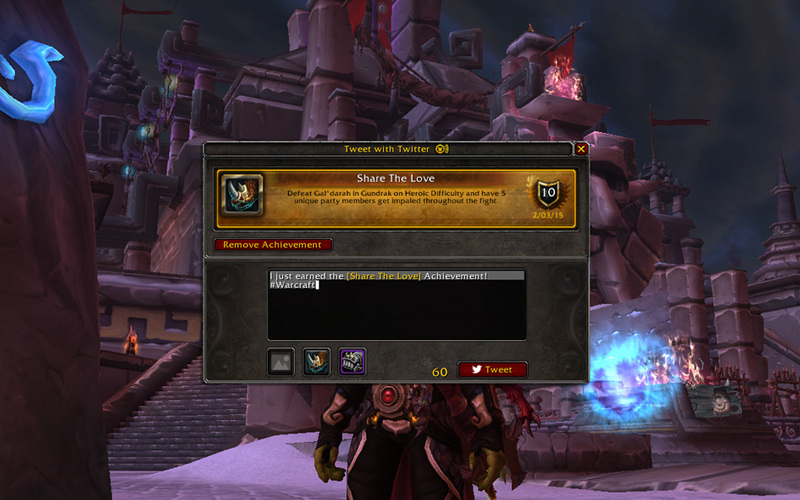 With the patch 6.1, Blizzard is introducing us to how you will be able to use Twitter inside the game. And who knows, if the feedback is interesting, it could be applied to others Blizzard games. 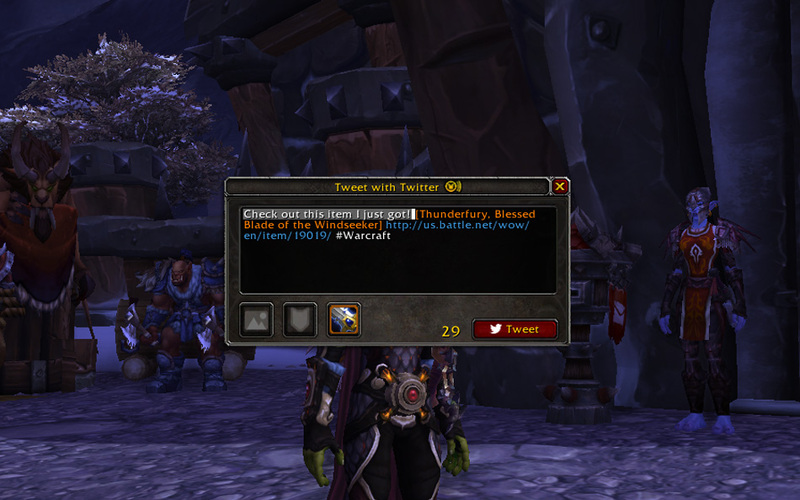 We have a new feature coming in Patch 6.1 that’ll allow you to send out Tweets directly to your Twitter feed while playing World of Warcraft. It includes the ability to send out text-only Tweets; easily take, crop, and Tweet out in-game screenshots; and let your friends know about your recent accomplishments. It’s easy to get started; all you need is a Twitter account! Under the Social section of the in-game Interface options, just check the Enable Twitter Functionality option, and then the Sign In button. You’ll be taken to a standard app approval page that will allow you to send out Tweets using the in-game UI. Once you’ve authenticated the app, you can initiate a new Tweet by typing /share into chat, or by clicking the small share icon that’ll appear in-chat next to Achievement and item drop notifications. You can also add an Achievement or item directly to a Tweet with the Twitter UI open by shift+clicking the Achievement or item. Tweets from within World of Warcraft are only ever initiated by you, and we will never automatically send out Tweets on your behalf—we’ve disabled Addons from sending them too. 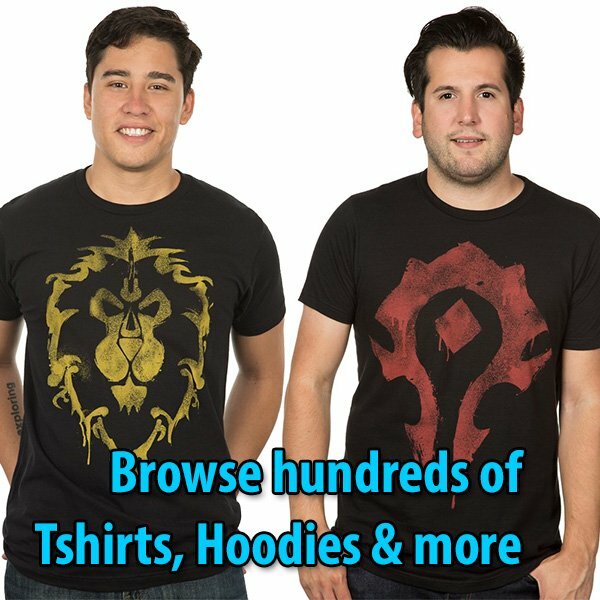 Our goal is to make it easier for you to Tweet while playing World of Warcraft, and more convenient to share fun moments with friends. Of course if you don’t use Twitter or don’t want to see any of this stuff, just don’t check the ‘Enable Twitter Functionality’ box and it’ll stay out of your way. We’re excited to see how people enjoy this new feature, and encourage everyone to jump on the 6.1 PTR to test it and provide feedback. Q: When authorizing the World of Warcraft app it says authorizing it will let you see who follows me, allow you to change my profile, and some other things; why do you need access to do all that? A: The Twitter app authorization system only has a few tiers of access that we as app developers can choose from, and the one we chose was the most basic with the least access required. It will list out a bunch of features this integration does not use, and have no plans to use, like those mentioned. 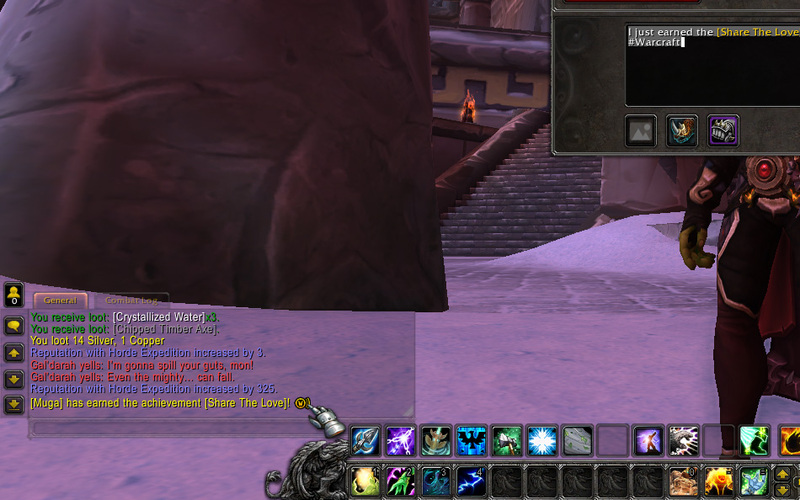 The World of Warcraft Twitter app only exists to allow you to Tweet while playing WoW if you want to, and only you can initiate and send out a Tweet. Q: So I’m going to see a bunch of Tweets in-game now? A: No, there’s no in-game Twitter feed; this feature just sends Tweets outside of the game. Q: What if I don’t want to see anything related to Twitter in-game? A: If you don’t authorize a Twitter account through the Interface option you won’t see anything related to the feature. Q: Are you going to start requiring Twitter use for in-game activities? A: No, we just think it’s a cool convenience feature for those who do like sharing their gaming activity on social media—if you don’t like doing that, no problem. Q: Isn’t this going to cause a lot of spam, or issues with people sending out inappropriate content from the game? A: This doesn’t add any functionality that isn’t already achievable through Twitter. This simply makes it more convenient to link items and share achievements and screenshots while playing. Q: Is there a separate login per-character, or is this account-wide? A: Your Twitter authorization is Battle.net account-wide. 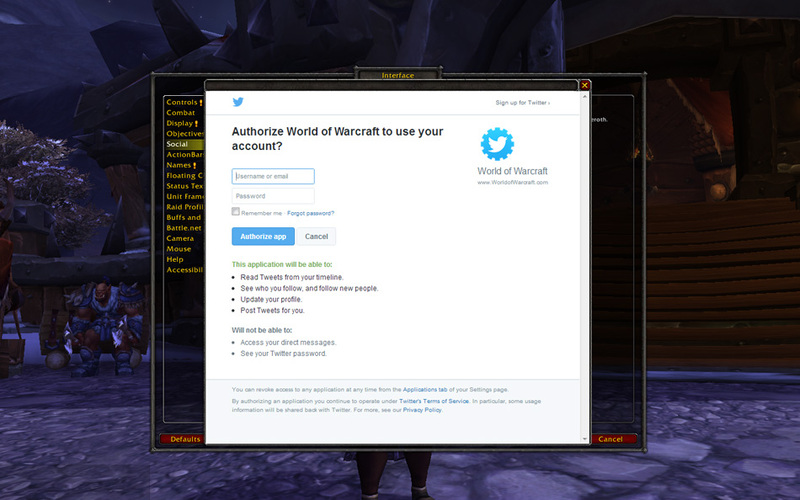 Any WoW license (as well as any characters) within the same Battle.net account will be able to Tweet from an authorized Twitter account. You’d want to sign out of Twitter through the Interface options before logging out of the game if you don’t want the authorization to persist between logins. Q: My child uses my WoW account sometimes; will they have access to Tweet from my Twitter account? A: The Twitter authorization will remain active until you log out of it through the Interface options. Q: I don’t use Twitter, but I do use some other social platforms, when could this be implemented for those? A: We’re starting with Twitter, but the /share functionality certainly could be expanded to other social platforms if you would find it useful. We’d appreciate your feedback and ideas on where we could go next. Q: This seems cool but I haven’t tried Twitter yet, how can I get started? A: Twitter has a helpful guide to get you started, and we maintain a list of official and employee accounts right here that you can follow to start building your list. Q: How moddable is this by Addons? A: The UI is fairly locked down to keep access to sending Tweets secure, and ensure that you—and only you—are choosing when to send them. 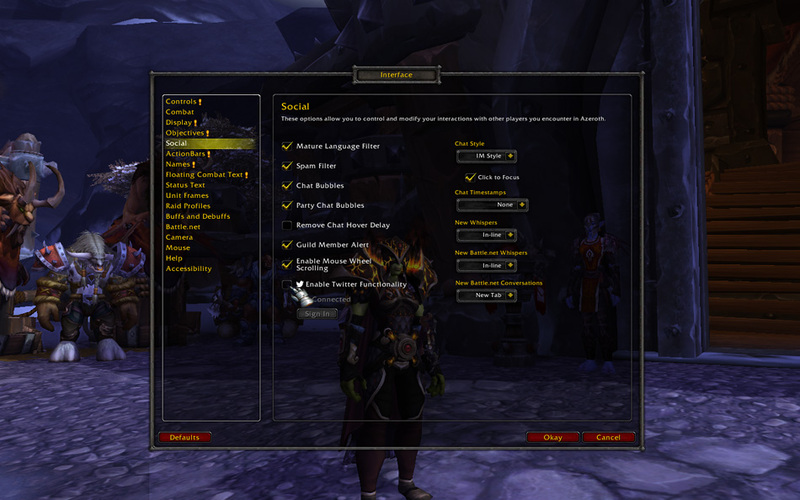 Addons may still perform some light functions, such as helping to populate the chat field in customizable formats.